Kathy Johnson's 2-year-old grandson was bullied out of his kiddie pool this week in the wildlife-rich Painted Hills neighborhood of Spokane Valley. 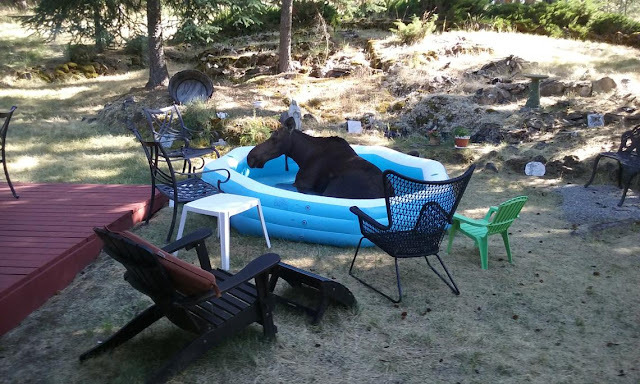 A bull moose took refuge from temperatures in the 80s Tuesday afternoon by sneaking into the Johnsons' backyard and cooling off in the inflatable pool. "It's not really one of those little pools," Johnson said. "It's actually quite big except when there's a moose in it. "The funny thing is that just last week a cow moose did the same thing," she said, as though word was spreading through the valley moose population that the Johnson's pool was a hot-spot for beating the summer heat. 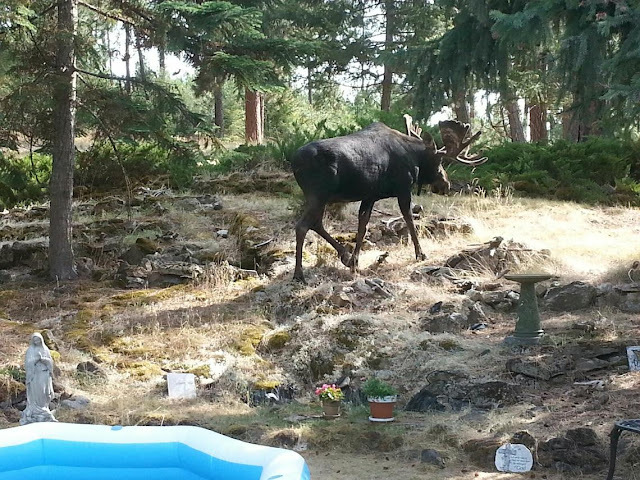 "The cow hung out in the pool for a long time and then got up and nibbled around the yard," Johnson said. "The bull didn't stay as long, and when he got up from the pool he moved on." 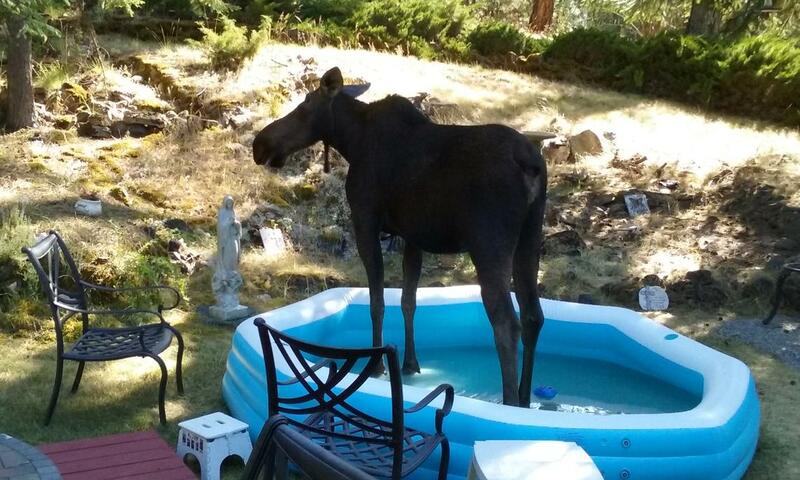 Johnson was especially amazed that the hooves of the adult-size moose, which can weigh well over 500 pounds, did no damage to the plastic pool. 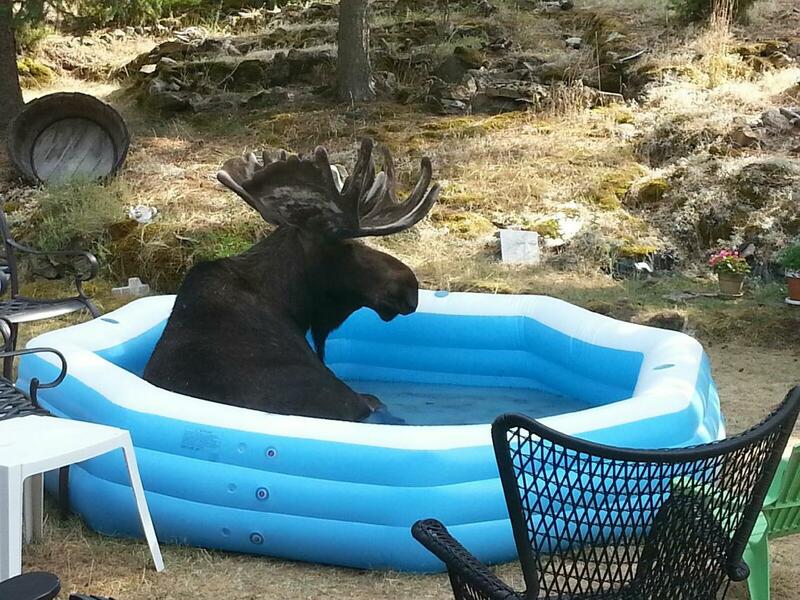 Responses to "Amazing Moment A Canadian Moose Chilling in an Inflatable Pool (Photos)"
That is so cool. It is one way too cool off. It's very lucky the hooves didn't cut the pool. Thank you for sharing this. They should send the pic to the pool company, can you imagine the slogan?